Today we have a special edition of Back Issues. 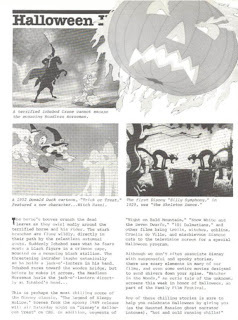 This spirited article from the October 28, 1982 Disneyland Line offers up some terrific ideas for thrilling and chilling viewing during this spooky season, though I wouldn’t use it as a viewing guide as this special aired 26 years ago. 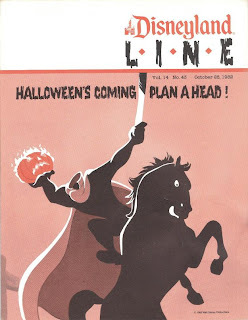 Still, all of the features listed are top-notch Halloween spook-taculars. Some of these may be hard to obtain, so, as the article says, plan a head! This is perhaps the most chilling scene of the Disney classic, “The Legend of Sleepy Hollow.” Scenes from the spooky 1949 release will air Saturday night on “Disney’s Halloween Treat” on CBS. In addition, segments of “Night on Bald Mountain,” “Snow White and the Seven Dwarfs,” “101 Dalmatians,” and other films bring trolls, witches, goblins, Cruella de Ville, and mischievous Siamese cats to the television screen for a special Halloween program. Although we don’t often associate Disney with suspenseful and spooky stories, there are scary elements in many of our films, and even some entire movies designed to shivers down your spine. “Watcher in the Woods,” an eerie tale of the unknown, screens this week in honor of Halloween, as part of the Family Film Festival.